Sydney and Melbourne, Australia’s two largets cities, have ridiculous housing prices. There’s an irony to a country as vast and underpopulated as Australia having two cities that are among the least affordable in the world. It manifests in a few ways. Fewer people under the age of thirty own their own house than at any point before World War II. Dwellings that were routingly three to four times the annual wage are now ten to fifteen. The sociological fallout from this will be felt for decades. And then you have what I consider the biggest visual tell beyond the number of cranes that dot Australian city skylines. No, not that Cities Skylines, though I need to get around to playing that again. 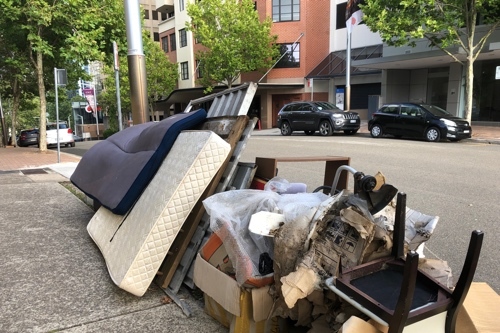 I’m going to call it the Rubenerd Vacancy Pile Index, or the number of illegally-dumped refuse piles outside newly vacant houses. With rent being as high as it is, people are constantly moving to save money or under threat of increases. Such a transient population does not nuture a sense of community; why take pride in your neighbourhood or get to know people if you won’t be there in a year? North Sydney currently has a three on the Rubenerd Vacancy Pile Index. The council is pretty efficient at clearing it all out quickly, rendering that number that much more impressive. Mascot easily had double digits when I lived there in 2015.